One of the challenges of teaching medieval literature is how different the texts can appear to today’s students. It’s often a combination of the language – Middle English is probably the most challenging language an English Literature student will encounter – the very different contexts, and a twenty-first century belief that the medieval is irretrievably distant and other. I’ve talked elsewhere about the dangers of the presentation of the medieval as other, but in this post I want to focus on teaching the medieval. Specifically, I’d like to share my efforts to counteract the distance and difference of the Middle Ages through experiential learning. Since the work of David Kolb in the late 1970s and early 1980s, experiential learning, or learning by doing, has been recognised as an effective mode of instruction in higher education and elsewhere. Variously interpreted through performance, art, music, dance, and more, it builds on ideas of active learning with the addition of a reflective component that invites students to learn through the process of reflection. I’m a big fan of experiential learning, and I wanted to see if I could incorporate it into my current teaching as a way to help students experience something of the medieval period we were studying. I was hoping that this would help something that feels quite distant seem closer to the students’ everyday lives and experiences. 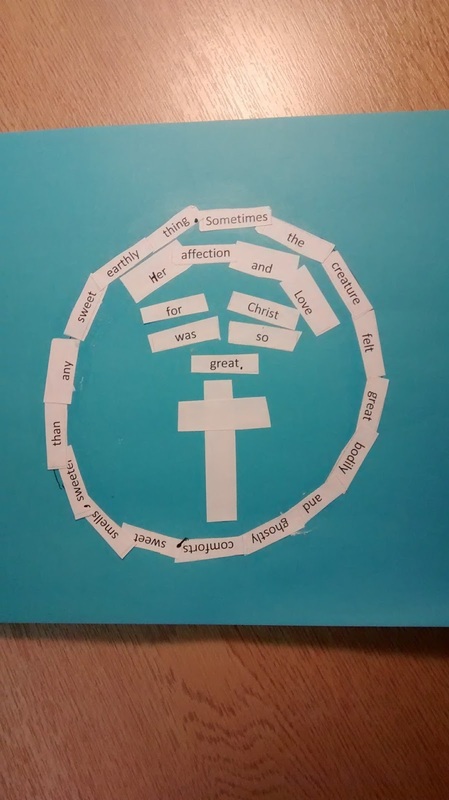 The activities I developed were focused around Margery Kempe and Julian of Norwich, two late medieval mystics who each wrote or had written texts outlining their faith and life. The activities are a combination of craft, collage, and experience. I know many of you also teach these texts, and I wanted to share what I did to see what you make it is and in case you'd like to try it out for yourself. Call it an early Christmas gift! I developed three class activities around these women’s texts. In what follows I'll describe each activity, including instructions for students and the materials required, and offer some reflection on the process. I'd be happy to share my slides and materials if you're interested in any of these - just drop me a comment or an email to burgea@cardiff.ac.uk. What it is: Working in groups to design and build 'life-size' medieval anchorholds. 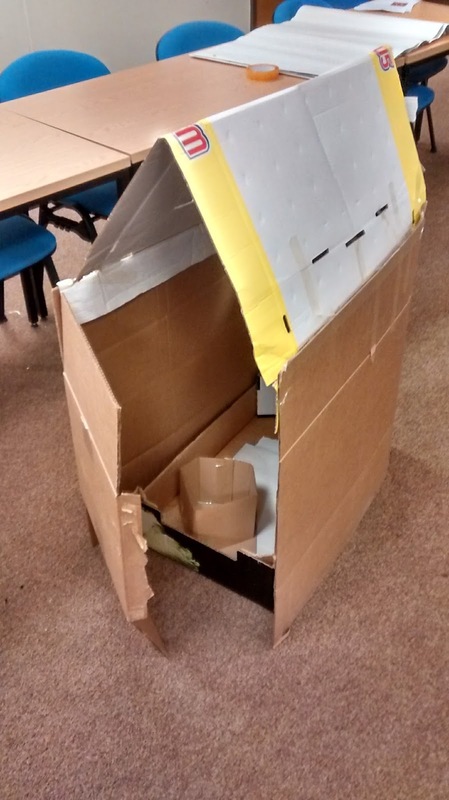 What you’ll need: lots of cardboard, a set of instructions, a space large enough for students to move around. What I was trying to do: The anchoritic lifestyle adopted by Julian of Norwich is one that often feels very strange to students. It can be difficult for them to imagine what it would have been like to be enclosed in a small room adjoining a church, to remain there for the rest of your life. When teaching in York, I would take students to All Saints North Street church, which has a recreated anchorhold. Unfortunately, there is no equivalent in Cardiff so I decided I’d need to do something else to give students a chance to feel what enclosure was like. Instructions for students: Based on the information below (from modern scholarship and medieval sources) you will work together to construct your own anchorhold. You can make this ‘authentic’ or adapt it, but it you must be able to explain how it relates to or reflects what you know about anchorholds. The rationale behind this task is to have fun after submitting your essays, but it’s also an opportunity to reflect on the physical space of the anchorhold (given that we don’t have one that we can visit). Constructing this space yourself encourages you to consider how it feels to be in this space and to consider questions of access (how big will you make it? will you fit inside? ), comfort, and function (will it need windows so the anchorite can talk to others? How big will these be? What will be inside the anchorhold?). This may help you to consider the effect of the space of the anchorhold on Julian’s writing. You should share tasks in your group so everyone has a role to play, perhaps appointing a project manager, and sharing out individual tasks. Accessibility: This task requires students to be able to use their hands to build a structure so is not accessible for any students for whom mobility is an issue. However, I was clear that students should work in groups and share task roles, allowing students to take on a director or 'management' role to make sure that any students unable to physically construct the anchorhold could still be involved in its design. I had intended that the anchorholds would be constructed large enough to fit a wheelchair inside, but in reality there wasn't quite enough cardboard to make it the appropriate size. 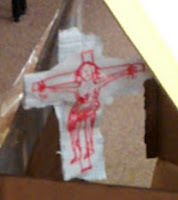 However, the students adapted their anchorhold so that it could be worn over the head to give some idea of enclosure. How it went: This activity helpfully fell on the same day that student mid-terms were due so it was a good opportunity for them to have a bit of fun after working hard on their written work. I was surprised how enthusiastically the students threw themselves into the activity. 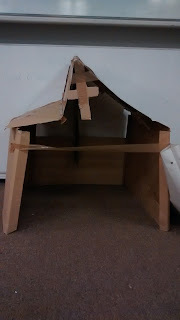 Once each group had their stock of card, they immediately set about the task of constructing walls that would stand by themselves, and how to construct a roof. As I circulated, I could see that they had picked up on some of the details of anchorholds - that they were usually on the north side of the church, that there was a narrow window (a 'squint') to see through the the altar, and that there were access windows for food - and had incorporated these imaginatively into their designs (see the images). The students were also discussing, as their structures took shape, what it would have been like to have lived inside one - this was exactly the kind of reflection I had wanted to inspire. Once the anchorholds were constructed, some of the students sat inside their constructions (if able to). Two grouped actually enclosed a classmate inside - one group with a paper door, and another group literally taped one of their group inside (the student then forcibly busted his way out of the anchorhold which prompted a conversation about how to escape these spaces if you so desire). Overall, this was certainly a fun activity. The students were talkative and engaged and their conversations were almost always centred on the task rather than drifting off-topic. Since the session, several students have shown an interest in enclosure as a topic for their final assignment. This might have happened anyway, but I hope that having a chance to reflect on the experience of being an anchoress or anchorite may have encouraged that interest. 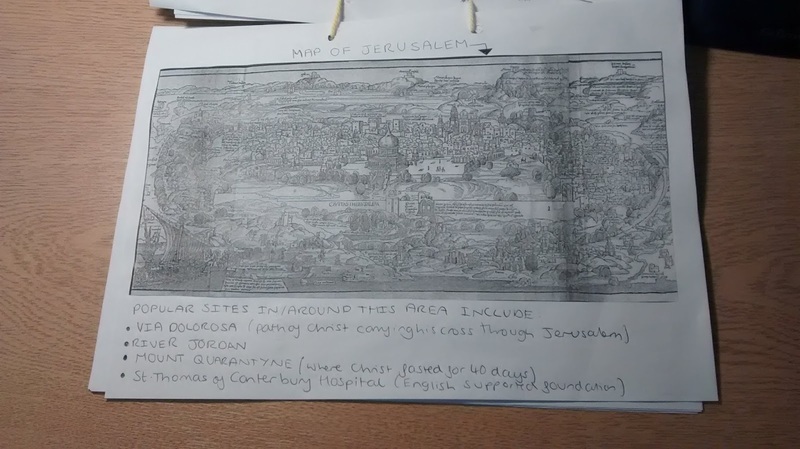 What it is: Researching and creating collaborative travel guides based on Margery Kempe's experiences of pilgrimage. What you’ll need: Pre-prepared and printed 'travel guides', pens, paper, glue, scissors, and source material (maps, extracts from the text, images). What I was trying to do: Pilgrimage was a significant form of late medieval devotional practice and Margery Kempe's book describes her experiences of pilgrimage in characteristically engaging detail. Many pilgrimage guides survive from this period so I was aiming to combine this context with the text of Margery's book to encourage close reading and analysis of quite a lengthy text and to imitate medieval practices of textual production. Instructions for students: Your task is to create a travel guide on behalf of Margery (you are acting as her scribes). Pilgrimage was a significant part of medieval Christian devotion, and several pilgrimage guides were published throughout the Middle Ages offering practical advice (where to sleep, what to eat) and describing the sights; it is estimated there are 526 extant accounts of pilgrimage to Jerusalem written between 1100 and 1500 (Voaden, p. 183). Margery’s book offers an evocative and information-rich account of pilgrimage and its perils. Working in groups, each of you will create a page which you’ll then bind together to form Margery’s guide. You can choose which of the following you want to focus on. Page 2: What preparations should be undertaken before one leaves? Page 3: Where should people go? What countries and sites? Page 4: How do they get there? Page 4: What kinds of activities can people do on pilgrimage? 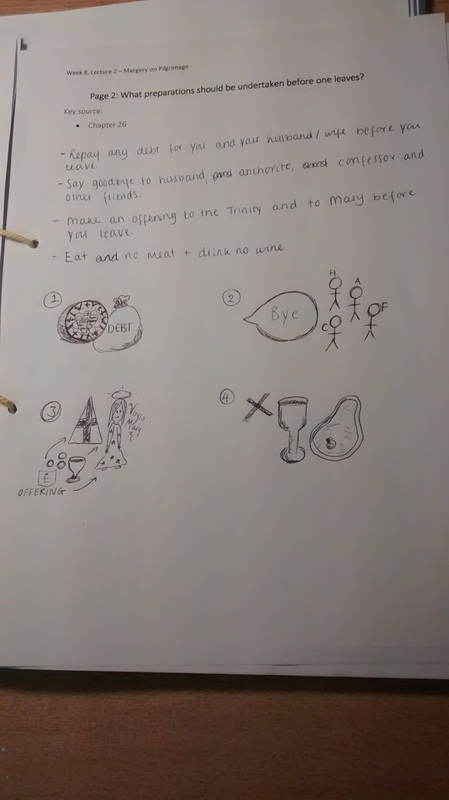 Page 6: What do pilgrims eat (according to Margery)? Page 7: What do they wear? Page 8: What are the dangers to watch out for? What can go wrong? There are several sources on which you should base your research for the guide. Margery’s book, of course, but also a range of maps, modern critical material, images of holy sites, and a medieval pilgrimage guide. 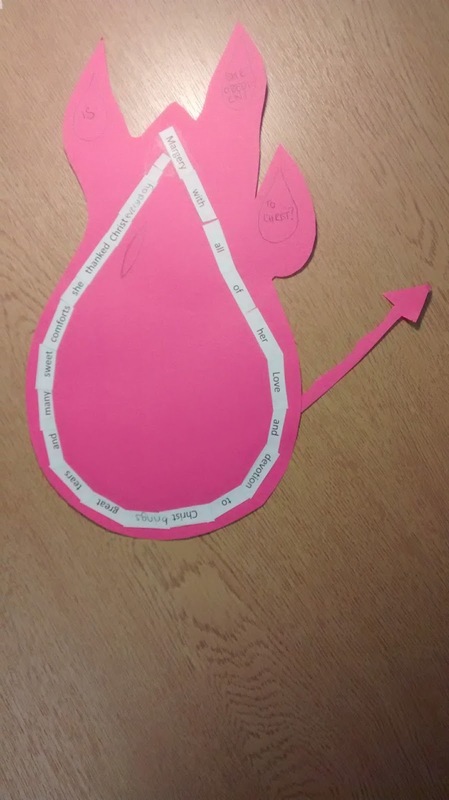 Accessibility: The activity involves writing and (potentially) cutting and sticking, therefore is not directly accessible for any student for whom this kind of mobility is difficult. The research element of the task, on the other hand, is accessible, especially if material is provided electronically. I therefore advised students to work together when collating the material, meaning that those students unable to physically write could still contribute to the task. 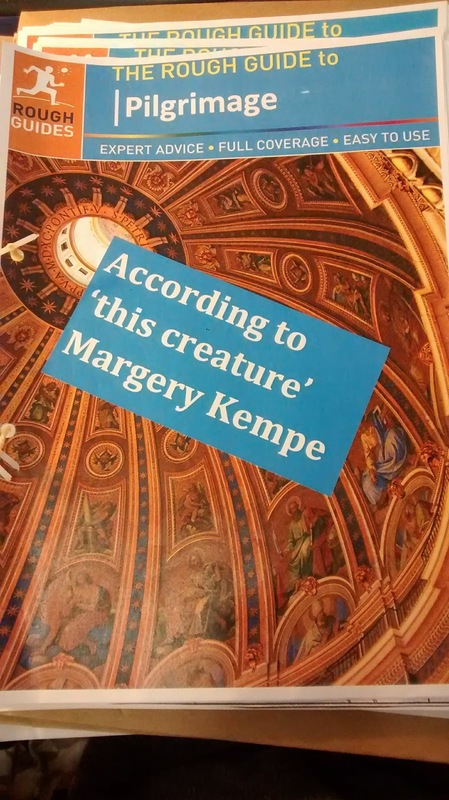 How it went: This was the first week we focused on Margery Kempe and I was aware that many of the students would not yet have read the text in detail. 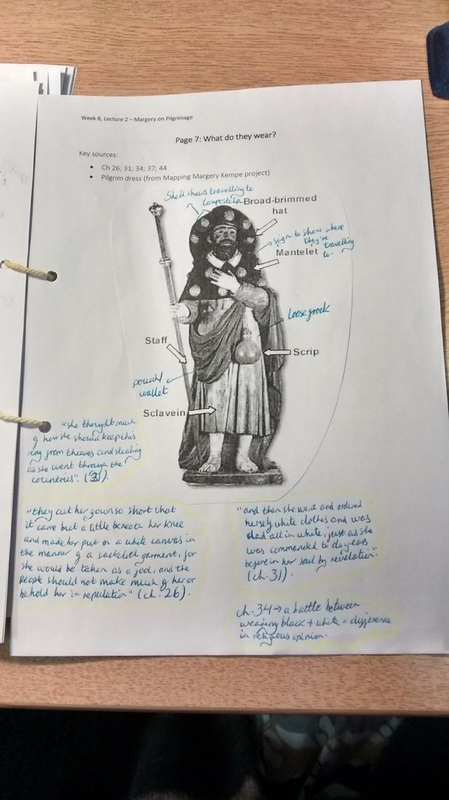 I was hoping that a focus on pilgrimage would help students get to grips with a significant portion of the text through a directed activity that would require them to research only a small part of the text, but that would result in a much more comprehensive piece of work. To ensure that students were exposed to as much detail as possible, I asked the students to exchange their completed guides with another group who could then see what other groups had written. We also went through each page in turn as a whole class. 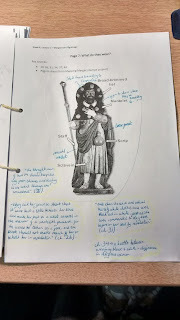 I was pleased to observe that students had picked up on the main elements of pilgrimage (preparation, purpose, location) and that they had noted the unique aspects of Margery's pilgrimage (such as her wearing of white clothes and her difficulties with her companions). 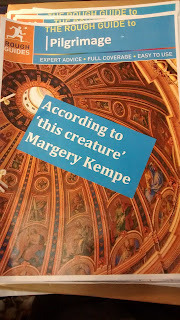 In subsequent lectures on Margery Kempe, students talked about her pilgrimage suggesting perhaps that the activity had supported their engagement with this part of the text. The activity seemed to engage all students during the class - this may be due to each student being assigned a specific 'page' to research. Some pages were completed more quickly than others - page 2 on preparation for example - and page 6 on what pilgrims eat seemed to be more difficult for students based on the extracts from the text I chose - I would perhaps provide alternative sources or extracts from elsewhere in the text in future. 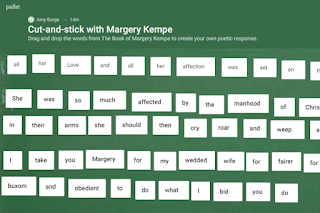 What it is: A cut-and-stick poetry exercise using Margery's own text. What you’ll need: Paper (I used coloured paper), glue sticks (one per pair at least), scissors (one per pair), a photocopied or transcribed page from a primary text. woman’ or a ‘good wife’? What are the key aspects of her book that you think are important, or that have struck you since you’ve been reading the text? What connections might you make with the twenty-first century or with the Middle Ages? – A photocopied page with excerpts from Chapter 35 of the Book of Margery Kempe. – A sheet of coloured paper. Then, fridge magnet style, cut out the words on the page and rearrange them, bisect them, add your own, do what you will with them to write your own response (poetry or prose) to the questions. Spend a couple of minutes now talking to your partner or thinking about your response to questions and then collect your items. You have approximately 30 minutes to work on this. Accessibility: As this was intended to be an individual activity (which was important for the reflective component) it was not possible to ask students to work in pairs where one would cut and stick for both participants. I therefore developed a digital equivalent that a student could use on a tablet using Padlet - here's a link to a copy I've made: https://padlet.com/burgea/margerykempe2. 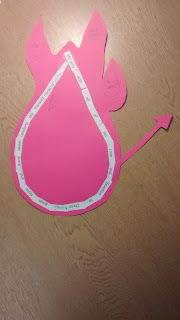 Rather than cutting and sticking, the student could then drag and drop to re-order the text. How it went: The students very quickly got on with the activity - whether this was because they were keen or because they had become more used to my teaching approach I'm not sure. It was clear that some students were more enthusiastic about the activity than others. I circulated around the students, asking them questions about why they had selected particular words, and how this related to their understanding of the text. This did seem to encourage students to think more deeply about the text and highlight aspects of their poem they hadn't previously noticed, for example the Margery's Tears poem (see right) led to a discussion of how far Margery's words and physical tears can be associated in her expression of devotion. 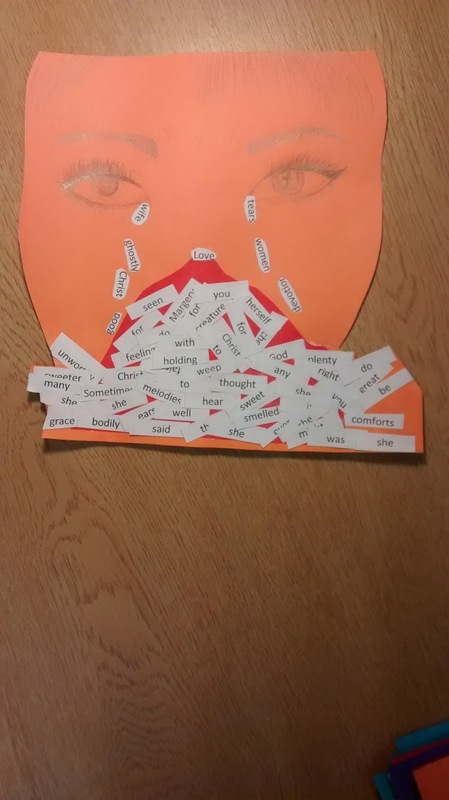 I think students were pleased with their 'poems' and were happy to keep them afterwards, and it certainly encouraged some good reflective thinking and there was a lot of evidence of identifying key themes and ideas from the text which was encouraging. I do think the activity could be made more challenging with an emphasis on textual analysis rather than reflection. This might have better met the expectations of the students, who were perhaps less accustomed to reflective work. In the future, I might begin with some discussion of the major themes of the text, and perhaps use this to direct the activity. We also encountered some difficulties with the digital version which didn't function correctly on the student's tablet. We managed to organise a work-around, using a word document I'd created as a back-up, but in the future I would ensure in advance that the site worked on the student's device, or make sure I had a second device to hand that we could use instead. NB: Thanks to my students for allowing me to share their work and for their enthusiastic participation in the above activities.